Fascia envelops the body, affecting every movement. It supports the body's form, stores potential energy and carries force from muscle to tendon to bone. 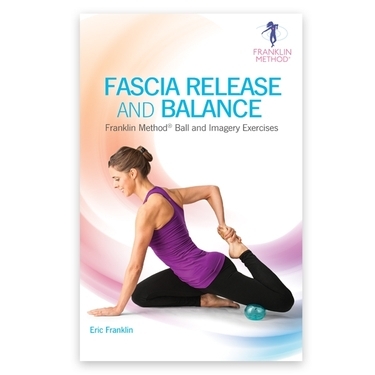 Eric Franklin's new book, Fascia Release and Balance, teaches how connective tissues integrate the body's components and facilitate all movements. This knowledge is reinforced by Franklin Method® ball-rolling and imagery exercises that release tension and train the fascia for expansive movement. 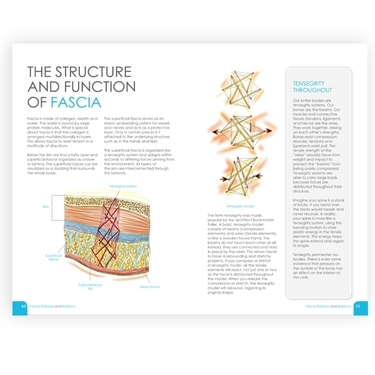 The first half of Fascia Release and Balance details the makeup of different types of connective tissue and illustrates how they work harmoniously with skin, muscle and bone to create movement. For example, visualizing movement as a muscle contracting to move a bone will leave your movements rigid and unforgiving. However, the body is not built this way. Muscles rely on connective tissues to carry their force to the bones on each end. By understanding and visualizing the muscles contracting to pull on the connective tissue, which then moves the bone, your movement regains spring and elasticity. This is just one of the many ways Eric Franklin helps redefine how you move. While not shying away from some anatomical terminology, the content is approached using artistic, colorful illustrations and metaphors to make it easily understood by readers of all levels. Once you understand the role and makeup of connective tissue (including fascia), Eric Franklin introduces new Franklin Method ball-rolling and imagery exercises that use anatomical imagery—building off your newfound knowledge of connective tissues—and specially designed balls to target specific areas of the fascia. Covering the length of the body, from jaw to foot, these tapping, rolling and massaging exercises not only free fascial restrictions but help you experience your body in a new way. This anatomical embodiment initiates effortless, functional movement that's properly supported by imagery in the mind. 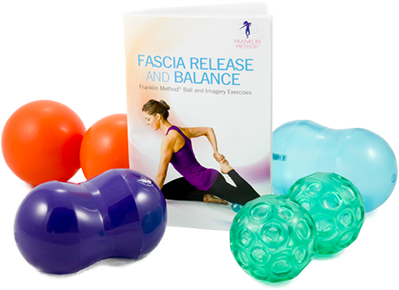 Fascia Release and Balance is ideally suited for anyone who wants to relieve tension and move freely and efficiently. Therapists, trainers and instructors will also discover inspiring techniques to deepen the connection of clients and patients as well as improve their ease and quality of movement.